There’s nothing better then sitting on the sofa with some friends, some popcorn and some free DVDs! 1. Choose a day and a time that will suit a lot of people. If you choose a Friday or Saturday night, people won’t have school the next day. Think about how many movies you want to watch, if each one is about an hour and a half, you’ll need at least four hours to watch two movies (once you include time for eating and talking). 2. Invite people. Give people lots of notice so they (and their parents) can organise things. The more the merrier! Get everyone to bring a small snack or drink so there is heaps of yummy stuff to eat. M. K. is shrunken to the size of the tiny citizens of a forest that is in deadly danger. Can M. K. help save their Queen, their tiny world, and save our world too? This is a very exciting movie with great animation. Two friends uncover a long-lost medallion that transports them back in time. They must survive the perils of the past as well as outwit the evil Cobra! Inventor Flint Lockwood thought he saved the world when he destroyed his machine that turned water into food causing cheeseburger rain and spaghetti tornadoes. But Flint soon learns that his invention survived and is now creating food-animals! 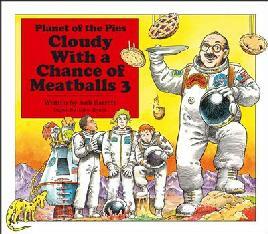 A sequel to the awesome Cloudy with a Chance of Meatballs. When Mike and Sulley first meet at university they are sworn enemies, but when their mutual dislike gets them thrown out of the School of Scaring, they join forces to compete in the school’s annual Scare Games and become friends. Chloe invites Mr Stink (a stinky, neighbourhood tramp) to secretly live in her garden shed. Chloe must keep this secret from her family, while her Dad is keeping a secret and Mr Stink is keeping an amazing secret too. 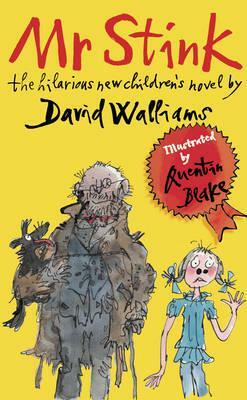 This movie is based on a hilarious book by David Walliams. 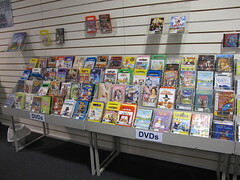 The library is getting new DVDs all the time so check out the full list on our catalogue. 4. Arrange some comfy chairs, bean bags, cushions and blankets around the TV. What movies do you want to see these holidays? You might have been lucky enough to go to the movies in the school holidays. There was plenty to choose from, including Brave and The Amazing Spiderman. We’ve just got two cool new books in the library that take you behind the scenes of these movies and tell you more about the characters. 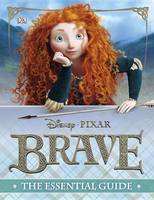 Brave: The Essential Guide gives you extra information about the characters in the movie and the places it was set. You can take the grand tour of Castle DunBroch, learn Merida’s likes and dislikes, find out about the clans, learn some top tips for archery and swordplay, and read more about the story of the movie. There are heaps of pictures from the movie, some of the best quotes from the characters, and fact boxes with extra information about the main characters. I really like the ‘Who Suits Merida?’ section where the different clans say why Merida should choose them. 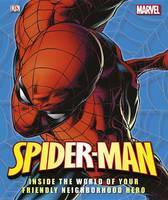 Spiderman: Inside the world of your friendly neighborhood hero contains everything you ever wanted to know about Spidey. This book is chock full of pictures of Spiderman, from his very first appearance through to his latest reincarnation. You can learn all about his costume, the man behind the mask, Peter Parker, his friends and family, his love interests, his enemies, and the main events in his life. If you want to learn more about Spidey’s latest nemesis, Lizard, or past villans, like Doctor Octopus and Sandman, you can find it all in this book. Did you know that there have been hundreds of different artists who have brought Spiderman to life over the years? Books into movies – what’s your favourite? What are your favourite books that have been made into movies? Add a comment and you’ll go into the draw to win a Hoyts children’s movie pass. Do You Want To See Arthur Christmas?? The Adventures of Tintin movie – what do you think? Make sure you enter our MASSIVE Tintin competition to win heaps of cool Tintin prizes. There are so many great movies coming out in cinemas in the Christmas holidays, and the one I’m most looking forward to is The Adventures of Tintin: Secret of the Unicorn. The movie is based on three of Herge’s Tintin books – The Crab with the Golden Claws, The Secret of the Unicorn and Red Rackham’s Treasure. Thanks to HarperCollins NZ, Random House NZ and Hardie Grant Egmont we have a MASSIVE Tintin prize pack to give away. The winner will get a copy of the amazing book, The Art of the Adventures of Tintin, a set of the Tintin movie tie-in books, a Tintin poster and a movie pass to go and see the movie at Hoyts. 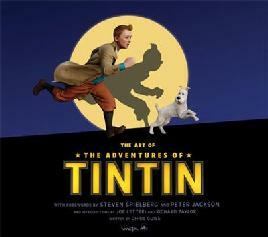 One runner-up will win a Tintin poster and a movie pass.